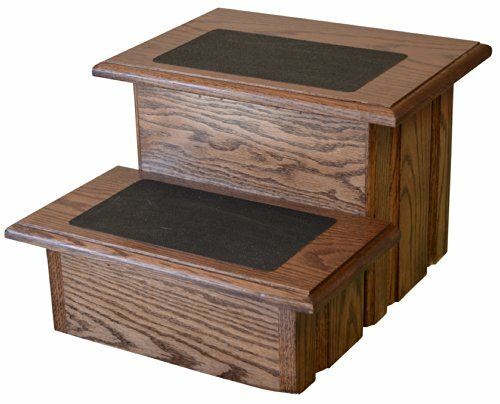 Step Stools by Premier Pet Steps are great for Kitchen or Bathroom or wherever a little extra reach is need. These Steps are very strong and stable and the beauty of the Solid Red Oak compliments any room Decor. We us only Solid Red Oak in our Raised Panel design, The same type of construction found in most kitchen cabinets. Our Steps will give your Little Helper access you want them to have. These Steps will look great and will provide years of service while bring the Warmth and Feel that only Real Solid Wood can provide into Your Home. The tread is 5 1/2" high and has an overall height to 11". The tread are 8" Deep and 15" wide with a top tread of 11"deep and 15" wide making them very stable. If you have any questions about this product by Premier Pet Steps, contact us by completing and submitting the form below. If you are looking for a specif part number, please include it with your message.